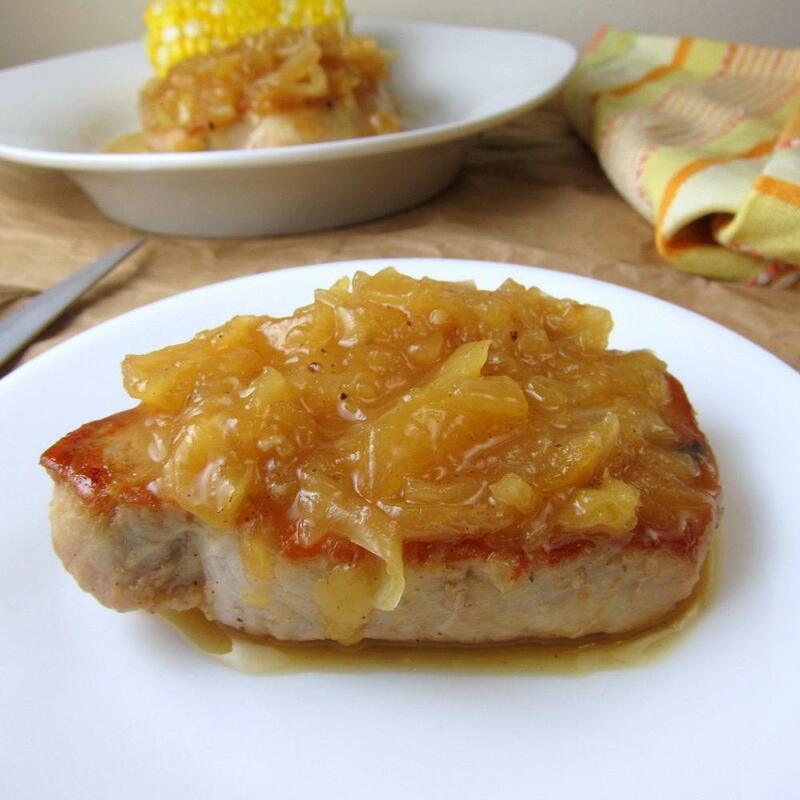 Easy Pineapple Pork Chops recipe. Perfectly browned pork chops with an amazing pineapple-Dijon sauce – ready in 30 minutes from scratch. Season the pork chops liberally with salt & pepper. In a large skillet, heat 2 tablespoons of olive oil and cook the pork chops for about 3 minutes on each side over high heat, or until they are nicely browned. Set aside on a plate. Add the remaining oil to the same skillet, and add the sliced onions. Turn the heat to medium and saute the onions for about 5-7 minutes, or until they soften and start to turn golden brown. While the onions are cooking, combine the pineapple preserves, white wine, chicken broth, and Dijon mustard in a small bowl and mix well. Add the mixture to the skillet with the onions, bring to a boil, and reduce heat and allow to simmer for about 5 minutes. Place the pork chops into the pineapple sauce in the skillet and continue to cook for about 5 minutes, or until the pork chops are fully cooked and reach an internal temperature of 145F. Serve by spooning the pineapple sauce over the pork chops.